In this latest video episode of the iGoldrush Report, Morgan Linton shows you how to get a great looking website in a few simple clicks without needing to know servers or have any development background. Learn how to install WordPress for free and take the first step in developing your domain names into brands. Over the next 10+ minutes, you will learn how to install WordPress, navigate the dashboard, enhance your new site’s look with themes, and protect & expand your site’s features with plugins, and add articles. The entire process can happen within an hour or two without writing a single line of code! Install WordPress – The easiest way to install WordPress is with a hosting provider, such as DomainIt or HostGator, that provide cpanel with Fantastico. Using Fantastico, you simply choose where to install and your admin password, then click install and you’re ready to go! Change the WordPress Theme – WordPress themes allow you to change the entire look of your website in seconds. To change your theme, you go to the ‘Appearance’ section on the left sidebar. Simply choose your theme and install! If you’re looking for fully customizable themes, we recommend Woo Themes and Elegant Themes. You can also browse WordPress for free themes to use. Akismet – this free plugin that comes with WordPress simply needs to be activated. Once activated, Akismet puts an end to comment spam, which can really grow as your site traffic grows. All In One SEO Pack – this is a great plugin that allows you to do some great seo customizations to your site, particularly with your meta tags. Add Articles to Your New Site – Now that you’re site is up and running, it’s time to add articles! To do this, simply go to “Posts” in the left sidebar and click “Add new”, then type in your title, article, text, and so on. When you’re finished, simply click “Publish”. Be sure to write your own high quality content though rather than copying from others, or hire someone to write articles for you. 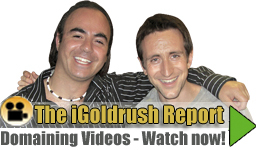 We hope that you enjoyed this episode of The iGoldrush Report! Be sure to visit The iGoldrush Report YouTube Channel and click SUBSCRIBE to be notified of future videos and comment below with any questions you may have!. Now that you’ve learned how to install wordpress, check out Episode #3: Researching Market Trends to Make Money from Your Domains. If you missed Episode #1, watch now for the basics on Developing Domains into Brands. About Morgan: Morgan Linton is a popular blogger, domain investor, developer and all around entrepreneur. Morgan brings his expertise to iGoldRush visitors in an exclusive monthly video series that focuses on developing domains into online brands in order to increase profitability. Guys, these are the BEST kinds of posts! Keep em’ coming. As domainers who arent flipping sites, we all should be gearing towards development and moving away from parking. Helping people understand WP and FTP Client really helps us as a community. An FTP post would be awesome as well, thats usually where I run into issues using host gator. I jsut dont fully understand it. Between this video and Morgans “WordPress 101” article, you are sharing a wealth of good info. Thanks and keep it up! Im subscribing to your guys channel now. Thanks for your comment, Michael, and we’re glad to hear that you’re subscribing to our channel! The main goal of these educational videos is to teach domainers how to develop their names into brands and it’s great to hear that you find them useful. Also, thanks for the suggestion! We’ll consider covering FTP in a future episode. Thanks for all the positive feedback! More exciting episodes to come! Thank you both guys for this series of video,can’t wait to see the next one,they’re really interesting and helpful! Thanks Greg! We appreciate the positive feedback.